Children's spurs with and without spur straps for sale. 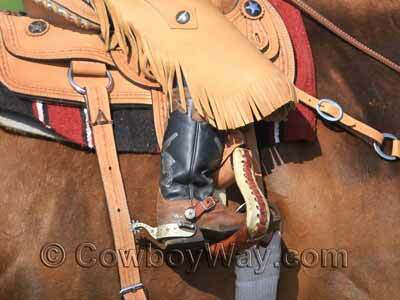 Children's spurs are similar to adult spurs but made to accommodate a smaller rider. There is usually a very good selection of both new and used spurs to choose from. Please scroll down for good information to know before you buy. Below are a few good things to know before buying children's spurs online or anywhere else. Are the spurs new or used? Amazon has mostly new spurs, while eBay usually has a good selection of both new and used. Are the spurs "real" or a toy? In other words, are the spurs meant to be used on the boots of a child riding a horse, or are they merely for play? Some sellers (especially on eBay), even though they're honest, don't know the difference themselves and therefore might represent the spurs incorrectly. Make sure you look at the photos are read the description carefully do you don't accidentally buy toy spurs. 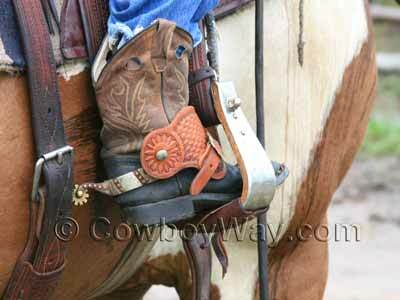 All kids aren't the same size, so neither are their spurs. If the seller doesn't give you measurements to let you know how big - or small - the spurs are, you may need to ask them before you buy. 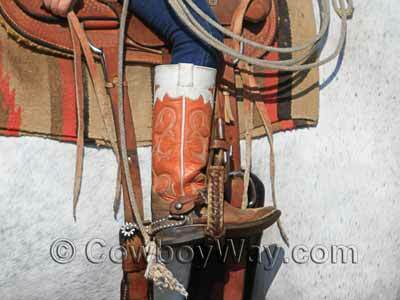 Do the spurs come alone, or do they come with spur straps? If a pair of children's spurs you're interested in is shown in photos with spur straps, don't automatically assume the straps are included: Read the description to be sure. How much is the shipping? Will the seller ship to your area? If you have any questions about a pair of children's spurs be sure to ask the seller before you bid or buy. Below: A pair of children's spurs with a wide band and wide spur straps. Below: A pair of children's spurs with silver studs on the bands.